Princeton Architectural Press, 9781616892814, 224pp. 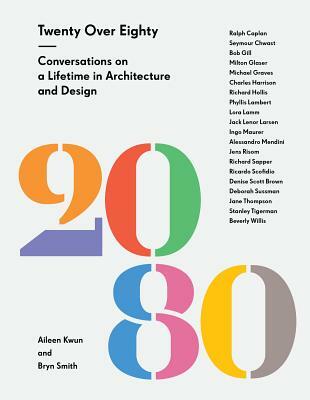 Twenty Over Eighty is a collection of insightful, intimate, and often irreverent interviews with twenty architecture and design luminaries over the age of eighty. Revealing conversations with leaders from a variety of fields—including graphic designers Seymour Chwast, Milton Glaser, Lora Lamm, and Deborah Sussman; architects Michael Graves, Denise Scott Brown, and Stanley Tigerman; urbanist Jane Thompson; industrial designer Charles Harrison; furniture designer Jens Risom; and critic Ralph Caplan—spotlight creators, thinkers, and pioneers whose lifelong dedication to experimentation and innovation continues to shape their disciplines well into their ninth decade. Twenty Over Eighty is not only a record of the remarkable histories and experiences of design's most influential figures but also a source of knowledge and inspiration for contemporary creatives and generations to come. Aileen Kwun is a writer, editor, and critic based in New York. Her work has appeared in Domus, Dwell, Icon, Metropolis, and Surface, among other publications. Bryn Smith is a graphic designer, writer, and critic. She lives in New York and has taught at Cooper Union, and the Rhode Island School of Design.